The process of formation of a Fe/C catalyst was considered as a sequence of topochemical reactions. It was demonstrated that potassium promotion accelerated the formation of magnetite at the stage of catalyst calcination in a flow of argon. The particle size of iron oxides decreased with the concentration of potassium. 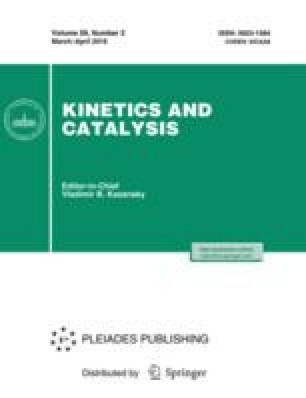 Potassium promotion also led to an increase in the concentration of Hägg carbide in the course of catalyst reduction by synthesis gas. Original Russian Text © P.A. Chernavskii, V.O. Kazak, G.V. Pankina, N.E. Strokova, Yu.D. Perfil’ev, 2018, published in Kinetika i Kataliz, 2018, Vol. 59, No. 2, pp. 251–259.